Rebecca Bosworth-Clemens graduated from the University of Maine in 2010 with a concentration in clarinet. She was born near Middlebury, Vermont and in high school she participated in the Vermont District and All-State Music festivals. During this time she became interested in music education and had her first taste of contra dancing and New England folk music. At the University of Maine she studied Music Education and Music Performance on clarinet and was first chair in the University of Maine Symphonic Band. As part of the Honors program, she designed a method book for beginning clarinet aimed at teaching sight-singing and ear training while simultaneously teaching technique. From 2012-2014 she worked in the Somerville Public Schools teaching K-8 general music, choir, and assisting the high school band. In the summer of 2014 she completed her certification in the Kodaly Method of music education through Anna Maria College. The Kodaly Method and her knowledge of folk music and dance greatly influence all aspects of her teaching. As a folk musician, she is passionate about developing aural skills in her students, and introducing them to a culture of actively participating in musical activities. She helps her students find joy in being creative on their instruments, singing, and dancing. She currently teaches K-6 general music, choir, and music & movement in Western Mass. 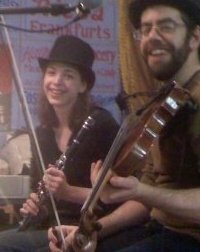 She started playing for dances with the band Upriver Reel while in college, and since then has performed with a variety of other musicians for contra and English dances throughout the northeast. Along with her primary band Cardinal Direction, she often plays for dances with David Kaynor and occasionally with the Great Bear Trio.